For the first time scientists have been able to prove a decades old theory on stars thanks to a revolutionary high-speed camera. Scientists at the University of Sheffield have been working with HiPERCAM, a high-speed, multicolor camera, which is capable of taking more than 1,000 images per second, allowing experts to measure both the mass and the radius of a cool subdwarf star for the first time. 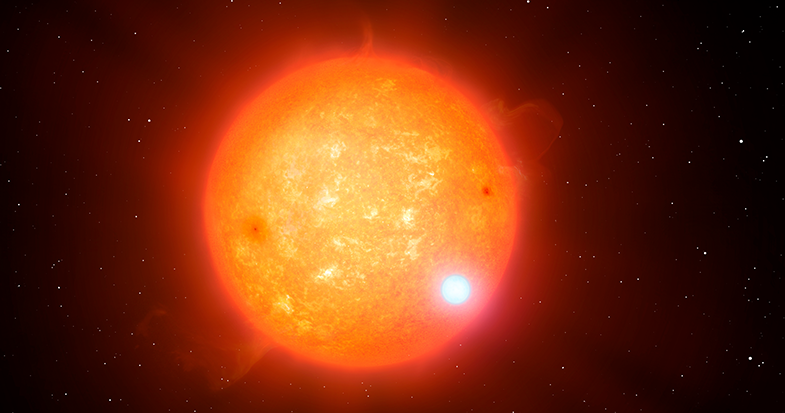 The findings published in Nature Astronomy have allowed researchers to verify the commonly used stellar structure model - which describes the internal structure of a star in detail - and make detailed predictions about the brightness, the color and its future evolution. Scientists know that old stars have fewer metals than young stars, but the effects of this on the structure of stars was, until now, untested. Old stars (often referred to as cool subdwarf stars) are faint and there are few in the solar neighborhood. Up until now scientists have not had a camera powerful enough to be able to get precise measurements of their stellar parameters such as the mass and the radius. HiPERCAM can take one picture every millisecond as opposed to a normal camera on a large telescope which usually captures only one picture every few minutes. This has given scientists the ability to measure the star accurately for the first time. Professor Vik Dhillon, Dr Steven Parsons and Dr Stuart Littlefair, from the Department of Physics and Astronomy at the University of Sheffield, led the HiPERCAM project in partnership with the Science and Technology Facilities Council’s Astronomy Technology Centre (ATC) and the Instituto de Astrofisica de Canarias, along with researchers from the University of Warwick and Durham University. Professor Dhillon said: “Now we have been able to measure the size of the star we can see it is in line with stellar structure theory. These results would not have been possible with any other telescope. The paper is the first to be published using HiPERCAM data, which is mounted on the Gran Telescopio Canarias (GTC) - the world’s largest optical telescope, with a 10.4 meter mirror diameter. The camera can take high-speed images of objects in the universe, allowing their rapid brightness variations - due to phenomena such as eclipses and explosions - to be studied in unprecedented detail. Data captured by the camera, taken in five different colors simultaneously, allow scientists to study the remnants of dead stars such as white dwarfs, neutron stars and black holes. The GTC is based on the island of La Palma, situated 2,500 meters above sea level, which is one of the best places in the world to study the night sky. The study marks the first results of a pioneering five-year project funded by a 3.5 million Euro grant from the European Research Council (ERC).